The rival boybands have spent the year vying for chart success in the notoriously tough to crack US market, but the Glad You Came Stars insisted they are fans of The X Factor runners-up. Tom Parker, 23, said: "We met them two years ago when they were on The X Factor - they're all really nice lads and we met them again in Los Angeles. "They're bigger than us - they've got more money than me!" 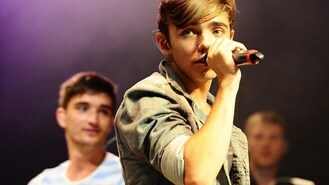 Tom also revealed he would love The Wanted to duet with Nicki Minaj on their next record. "We're just kind of putting the feelers out there for the American album at the moment, so hinting for a collaboration," he added. Bandmate Siva Kaneswaran insisted the band hadn't let fame in the UK and US go to their heads. "It's the team around you (that keeps you grounded), we have the same team around us that we had when we started off, and your families and your friends keep you grounded so that's how we do it," he added.